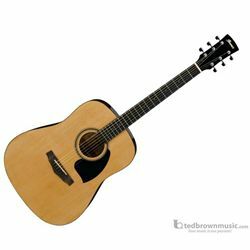 Styled in a natural high gloss finish, the PF Performance Series Ibanez PDR10 is a dreadnought acoustic guitar offering a spruce top with agathis back and sides. The PDR10 is a suitable entry instrument for those just learning to play guitar. Its 25.6" scale neck is made of mahogany, giving you 20 frets and a fingerboard fashioned out of treated New Zealand pine. White dot inlay provides visual indication of where to put your fingers. Chrome die cast tuners secure strings to the headstock, while a New Zealand pine bridge anchors the strings to the body.